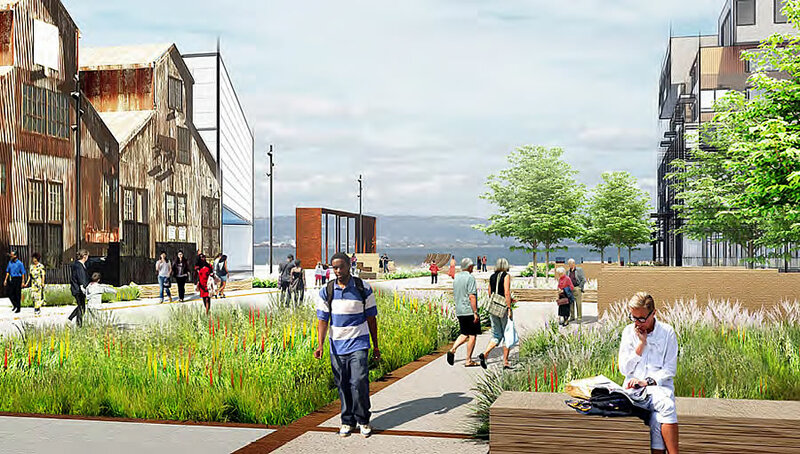 With the complete redevelopment of San Francisco’s Pier 70 having been formally approved in October, and the ground for the 28-acre project slated to broken early this year, the detailed plans for over 6 acres of parks and open spaces along Pier 70’s shoreline will be presented to the Pier 70 Design Review Committee next week. 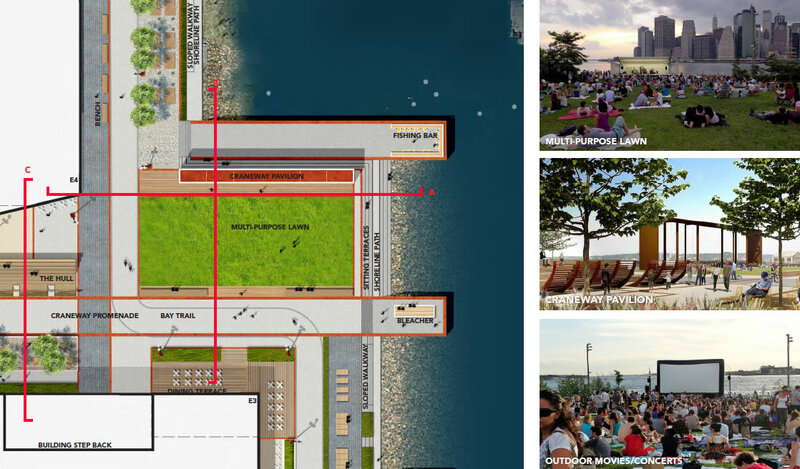 As designed by James Corner Filed Operations, the shoreline plans are grouped into three distinct areas: a Waterfront Terrace, Slipways Waterfront and Waterfront Promenade. The Waterfront Terrace runs along the northern 503-foot-long section of the project site’s shoreline, and consists of a 4926-square-foot public lawn, a 1971-square-foot picnic and seating area which would contain space for commercial food and beverage vendors (“Picnic Grove”), a deck and viewing pavilion oriented to the ship repair dry-dock, a 6-foot-wide shoreline path, and the 16- to 20-foot-wide Bay Trail. The Slipways Waterfront runs along the central 278-foot-long section of the project site’s shoreline. 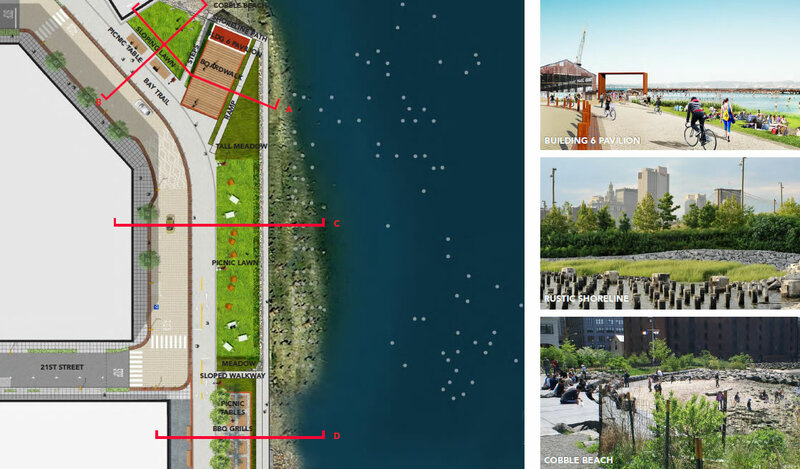 The Slipways Waterfront is part of the larger “Slipways Commons” open space area which begins at the shoreline and continues west—beyond the 100-foot shoreline band—to Maryland Street. 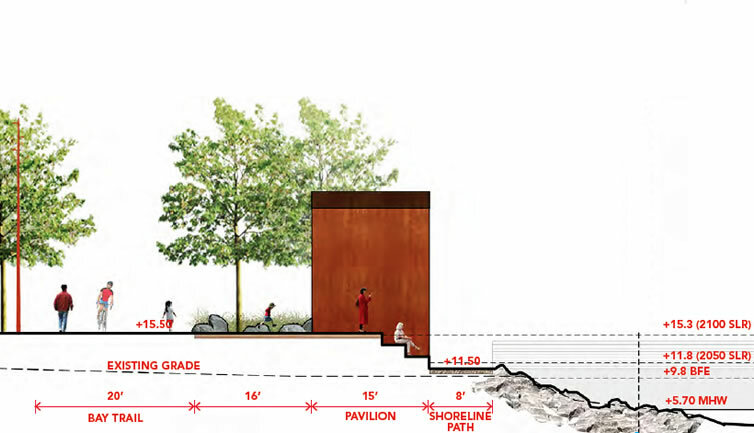 The Slipways Waterfront and Commons include a 8,467-square-foot lawn (“Central Lawn”), hardscaped gathering and event spaces, art installations, a viewing pavilion (“Craneway Pavilion”), and the 16- to 20-foot-wide Bay Trail. The Waterfront Promenade runs along the southern 516-foot-long section of the project site’s shoreline, and consists of a café terrace with areas reserved for both public and commercial (private) use, picnic and seating areas (“Chaise and Picnic Lounges”), historic craneway structures that provide opportunities for fishing, gathering and Bay viewing, a deck and viewing pavilion (the “22nd Street Pavilion”) an 8-foot-wide path running parallel to a riprap revetment, and the 16- to 20-foot-wide Bay Trail. A drop-off area for vehicles is provided at the terminus of 22nd Street. Along with the inland Commons and Market Square, the open spaces are slated to play host to “art exhibitions, theater performances, cultural events, outdoor fairs, festivals and markets, outdoor film screenings, evening night markets, food events, street fairs, and lecture services,” including up to four events a year with expected audiences of up to 5,000 people. The open space and supporting venues look great. Hopefully the area is “forested” as much as possible. SF has a dearth of trees and large developments such as this with significant open space are perfect opportunities for increasing the city’s canopy.The picnic grove and café terrace with their food vendors are essential and should prove popular. 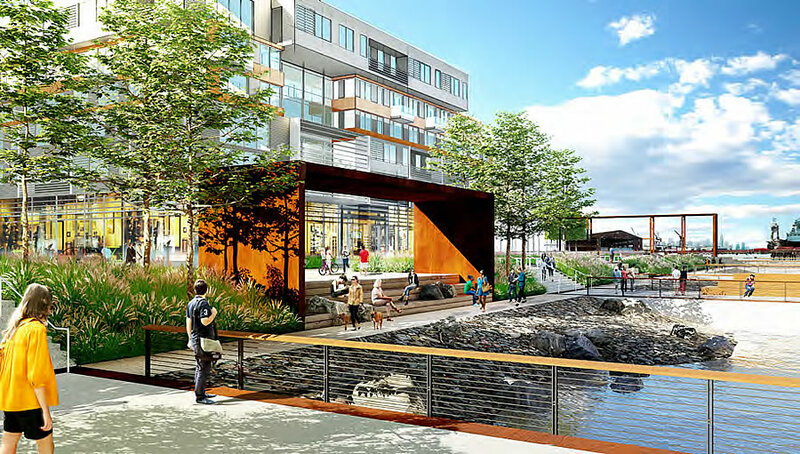 The shortcoming in these plans are the lack of any sit-down restaurants at the water’s edge. Perhaps with outdoor eating terraces above the water. Restaurants such as this, at water’s edge, abound around the Sound. Regular visitors such as myself make it a point to try a new such restaurant with every visit. I’m not talking touristy Fisherman’s Wharf restaurants but rather local oriented restaurants. Mission Rock fails to include this feature as well. 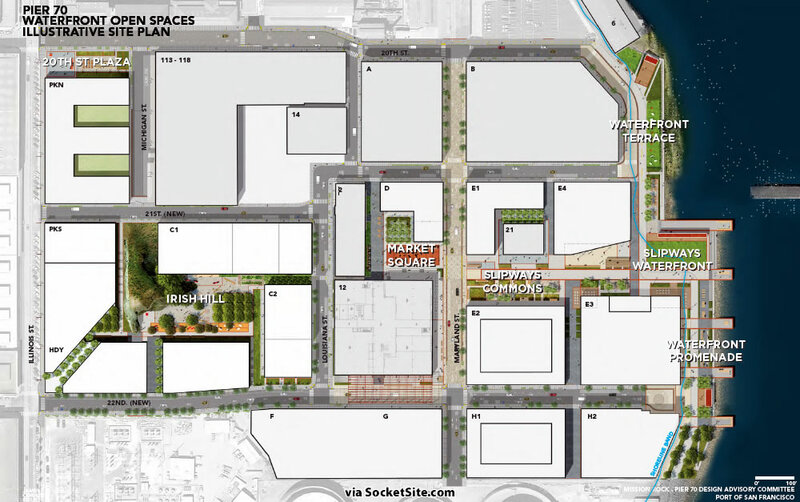 As far as I know, the other planned SE waterfront developments will lack such amenities also. . 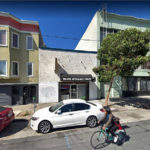 It does not have to be restaurants – what about a gallery, perhaps owned by SFMOMA, at water’s edge which features local artists and craftspeople. Adding a modest commercial element at points along the SE waterfront could further animate the area..
Don’t you ever go outside? Not on a rainy day. Trees are not really native to San Francisco (except the ones that grow money). Next, we’ll have calls for snow machines on Twin Peaks? If you call scrub oak and manzanita a “tree”. More like large bushes. Too damn much wasted “open space.” How about less lawn and more urban amenities? I was going to say the opposite. Not much actual green – just a lot of specialty pavement. I doubt any of the green shown will actually be usable by people other than the lawn – the City requirements for stormwater treatment are very pedestrian unfriendly. And only 5′ of fill on the Bay edge portion? Given the high levels of contamination – and the fact they need to do a cap or a barrier or something to address that – they are really proposing doing the minimum on moving dirt and addressing flooding. It’s nice they are saving the historic buildings and expanding the street network though. You’re joking, right? The “largest” lawn is under 8,500 square feet … that’s less than 85 feet x 100 feet, or about the size of *two* whole residential lots in the Richmond or Sunset. As a “Central Lawn” to serve this entire development. And *that* is a joke – woefully small and inadequate. 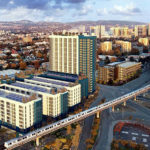 Required by way of Proposition B, the State’s legal challenge of which was recently dropped, the ballot measure which increased the 40-foot height limit for the Pier 70 site, but also limited new buildings to no more than 90 feet, was passed by voters in 2014. I don’t get the orientation of the illustration titled “Multi-Purpose Lawn.” Is the picture reversed? Looks more like Chicago from Oak Street Beach. Oh, I guess I get it now. 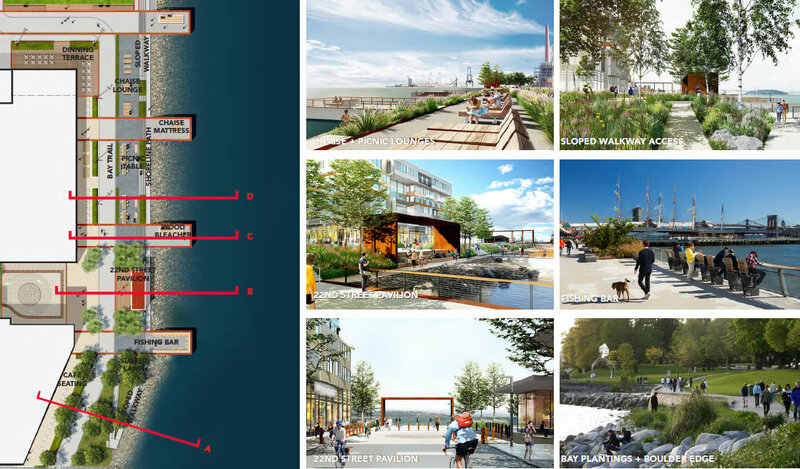 Some of these are illustrations of proposed Pier 70 features and some are actual pictures such as the Fishing Bar which appears to be in Manhattan bellow South Street Seaport. I do believe that other is on Chicago’s Lakefront. Where can we view the source file/pdf? Maybe I’m missing the link. The photo used for the “multipurpose lawn” sure looks like it’s a MUCH bigger place. This was another wasted opportunity for open space. Future generations are going to wonder what we were thinking when we covered the [east] side of the City with three- to six-story buildings. I often wonder if any of the city planners and architects in this City have ever traveled to anywhere else. Why does everything seem to be planned and assembled as if it’s never been done before?